Posted under Library, Random on Tuesday, December 20th, 2011 at 9:07 am, by Brian Herzog. Post and comments available via the RSS 2.0 feed. Both comments and pings are currently closed. Those look suspiciously like weeded copies of the Readers’ Guide to Periodical Literature to me. We tried to build a book tree like this for our Christmas display last year – it can actually be pretty challenging to make it work and come out looking like a decent tree! As far as marking them “display,” we had been saving green books from weeding and donations that weren’t going to be added into our main collection. That way, none of our books were out of circulation. I hope you do get a chance to visit the Sandusky Library. There are great decorations throughout the whole building! 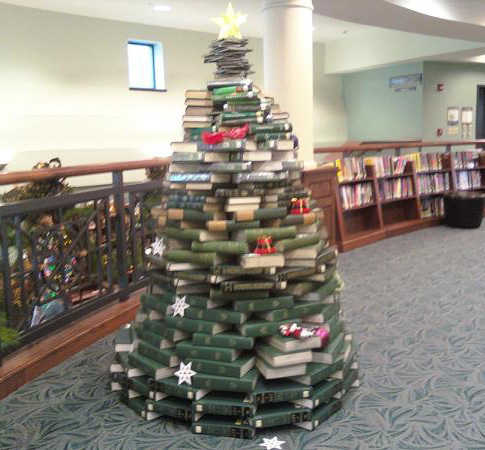 Thanks for tips on how to make a tree like this – hopefully I can talk my library into trying it next year. @Dorene: unfortunately, I didn’t make it to the library. Actually, I hardly even left the house – too much food to eat and too many nieces and nephews to play with. Hopefully next time.